Op. 3 was titled "L'estro armonico" which means "The Musical Inspiration" or "The Harmonious Fancy." It is a collection of 12 concertos for solo violin or groups of violins with a small orchestra. "L'Estro armonico" had a tremendous impact on composers in Northern Europe. 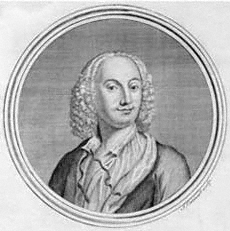 After this work was published, several composers traveled to Italy to take lessons with Vivaldi, while others paid him the more subtle compliment of making arrangements of his music (such as J.S. Bach, who arranged five of Vivaldi's concertos from "L'Estro armonico" for keyboard). *Although this online string class is provided free of charge, all rights are reserved and this content is protected by international copyright law. It is illegal to copy, post or publish this content in any form, and displaying any of this material on other websites, blogs or feeds is prohibited. Permission is given for individual users to print pages from this website for their personal, non-commercial use.